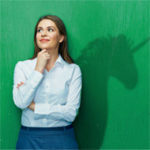 What’s the three most important aspects of a property? Location, location and – you guessed it – location! Never has that been more true in the world of online search and content marketing. 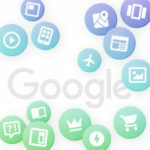 As mobile increasingly becomes the focus of Google and other search engines, the ability for consumers to find a meal, a supermarket or retail outlet “near me” is segregating marketers into haves and have-nots based on whether they’re creating great content that directs potential customers from search to sales in an instant. 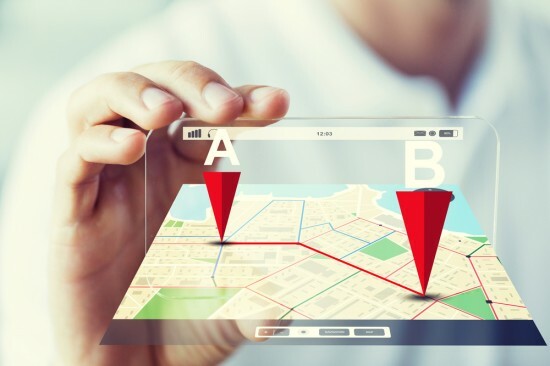 Now comes the reckoning for marketers who haven’t heeded the call of location-aware trends, or “near-me” optimization, according to an analysis of Searchmetrics data. 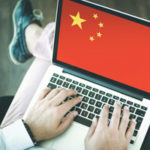 Out of the wreckage caused by last year’s Phantom update and real-time Penguin updates, sites that have focused the efforts on location-aware marketing have gained a tremendous amount of visibility, while laggards have taken a fall. Marketers who focus on offering better visual experiences, greater information and easy ways to accomplish the user’s intent (finding and booking a restaurant, for example), are starting to pull ahead against entrenched competition, our analysis finds. Google, Apple, Firefox and other search engines all have adopted location-aware browsing to bring users more relevant information faster. That’s led companies far and wide, from Facebook and Booking.com to Airbnb and TripAdvisor, to create user guides and content optimized toward local market. Using Searchmetrics data to analyze the local and travel market, I decided to examine the fortunes of TripAdvisor and Yelp to illustrate the perils and promise of location-aware marketing. First, I will readily concede that TripAdvisor not only offers reviews but bookings. That means you can’t do an apples-to-apples comparison with other travel and local sites (Expedia.com, Yelp, Booking.com, etc.). Yet, it is possible to segment the data from the TripAdvisor sites to create a more accurate and fair comparison with Yelp. More on that in a bit. Last year, I wrote a couple of posts on TripAdvisor’s travails. In March 2016, the site appeared to suffer Google penalties because of their backlink structure. 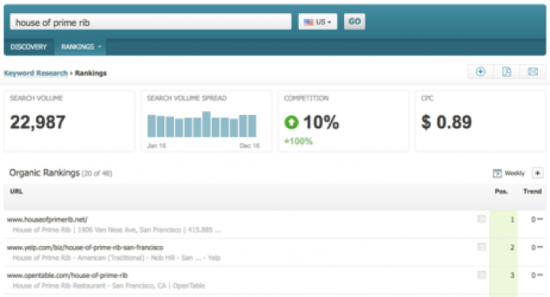 Since then, it’s roared back, achieving its all-time high SEO visibility score. 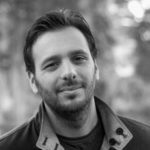 To understand where that growth is occurring, I sampled nearly 30,000 keywords to uncover the fact that most of it is happening in the /tourism, /hotels and /restaurant “directories.” (TripAdvisor doesn’t use a conventional directory structure; therefore, a direct SEO Visibility analysis is not possible). To compare the results against Yelp, I looked at Yelp’s /restaurant directory. You’ll note in the chart below that Yelp has been a clear winner against TripAdvisor. Since Yelp uses a more conventional directory structure, its easy to compare the yelp.com/biz and yelp.com/c (category pages) directories to determine which lost the most visibility. Putting the yelp.com/c/ directory on a secondary axis, we’re able to identify that the yelp.com/c/ directory lost the most amount of visibility (percentage-wise). That specific directory caters to more general searches, such as “food in San Francisco,” “restaurants in San Francisco,” and various “Near Me” searches. Even though we’re only looking at one keyword – it really does tell an interesting story. 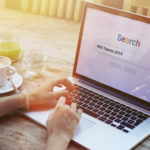 Looking further into this by using about 100+ very high-search volume terms with “near me” in the query (such as “Chinese food near me.”“pizza places near me,” “steak houses near me,” using a Google iOS Mobile search engine – we really see how TripAdvisor is now dominating the restaurant scene. That’s almost double the visibility, which translates into almost 20% of SEO market share for these specific terms. Not bad! 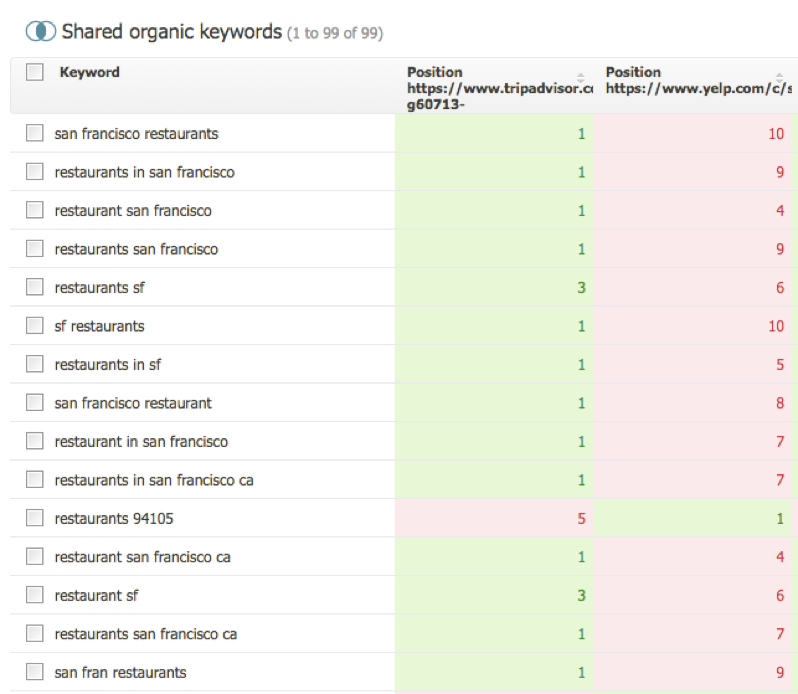 TripAdvisor uses strong content and category page structure to its advantage, ranking between position 1-3 for almost all “restaurants in SF”-related terms. 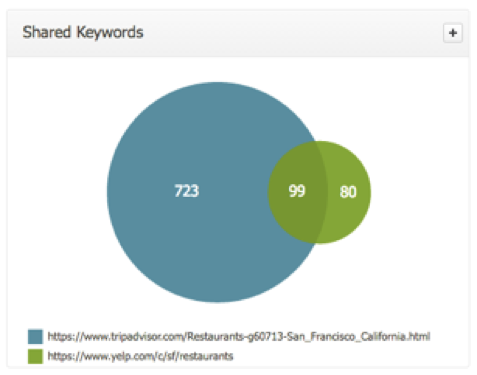 For that specific page, Yelp ranks for 179 keywords, while TripAdvisor ranks for 822! 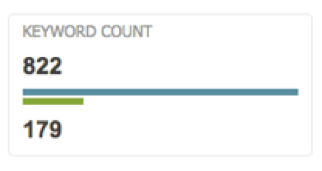 This is even better translated when looking at the unique vs. shared keywords graph below. Of those 179 keywords, about 100 of them are in competition with TripAdvisor. 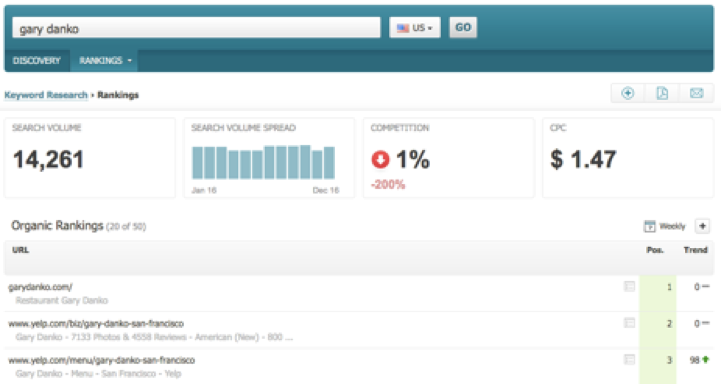 On the other hand, TripAdvisor sits on a comfortable 723 keywords free of competition from Yelp. How does this translate into rankings? Well, putting all the above-mentioned info together, we see that TripAdvisor comfortably ranks between position 1-3 for almost all “restaurants in SF” related terms. 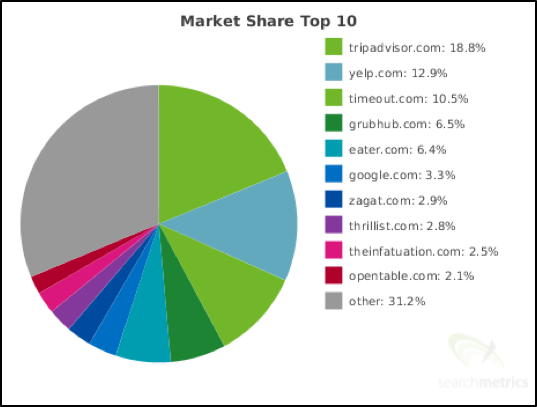 However, once again, TripAdvisor has done a much better job than Yelp in terms of content, preventing Yelp from ranking above TripAdvisor’s restaurant category pages. Having said all that, Yelp still does a great job in other categories – its main strength against almost anyone is its business pages. 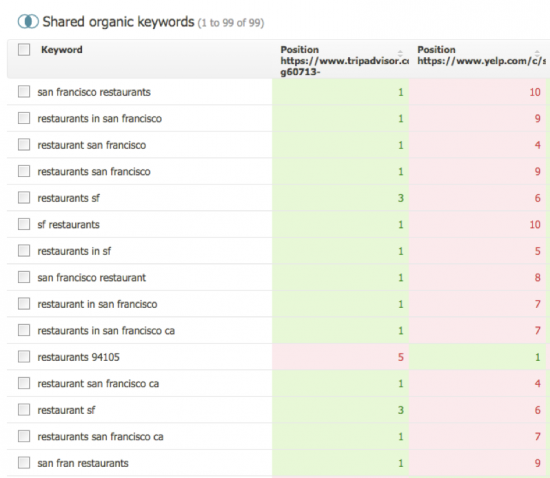 Almost anything related to a store name, or restaurant name, Yelp will outrank almost anyone. As we’ve seen before, the /biz/ directory takes up most of its SEO visibility. Yelp is fighting back on the location-aware front, too. In January, the privately held company unveiled a home page update, featuring “an emphasis on visuals and photos with some of the best shots on Yelp (credits included for each Yelper!) behind the large search bar,” product manager Lindsay Goyne wrote in a blogpost. The changes, and others, will help users better navigate the site, and find what they’re looking for quicker, Goyne said. So, not all hope is lost…well…as long as this downward trend doesn’t continue. Can TripAdvisor continue this steady growth? Hard to tell; so far, it’s looking promising, we’ll be looking into the growth of other subdirectories in upcoming articles. Stay tuned for Part 2: How Booking.com is booking a spot to the top.